Plays on any homeworld. 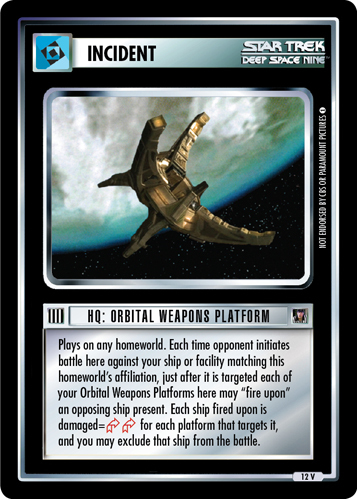 Each time opponent initiates battle here against your ship or facility matching this homeworld's affiliation, just after it is targeted each of your Orbital Weapons Platforms here may "fire upon" an opposing ship present. Each ship fired upon is damaged = for each Platform that targets it, and you may exclude that ship from that battle. Image Source: Deep Space Nine: "Tears of the Prophets"